$9/month (reg $10) Simple 250 Plan - 250 minutes, texts count as 1/3 minute each. $9/month (reg $10) Flex Plan - 160 rollover minutes, texts count as 1/3 minute each. $11.50/month (reg $12.95) Simple 500 Plan - 500 minutes, texts count as 1/3 minute each. $16.50/month (reg $17.95) Simple 1000 Plan - 1000 minutes, texts count as 1/3 minute each. $26.95/month (reg $29.95) Unlimited Plus Plan - unlimited talk & text, 500 MB data, 400 MMS. $31.95/month (reg $34.95) Unlimited Talk & Text Plan - unlimited talk, text & MMS, 1 GB data. $40.95/month (reg $44.95) Unlimited Talk & Text Plan - unlimited talk, text & MMS, 2 GB data. Unused Flex Plan minutes rollover indefinitely. Minutes, texts, MMS and data allowances on other plans are "use it or lose it", good for for one month. Unused data and MMS do not rollover on the Flex Plan or any other plans. To take advantage of the Serve and Save discount, current and former military members need to do a one time confirmation of their service through the online identity verification site ID.ME. The Serve and Save plans can't not be combined with any other Pure TalkUSA discounts but, like all Pure TalkUSA plans, they are eligible for 5% back in Shop Your Way Points each month. PureTalk is noted for good, US based support. SIMs are free , LTE is available and plan prices include all taxes and fees. The only payment option is auto-pay using a credit or debit card. With Serve and Save, Pure Talk is going head to head against recently launched Defense Mobile, an AT&T and Sprint MVNO that only accepts current and former military as customers. 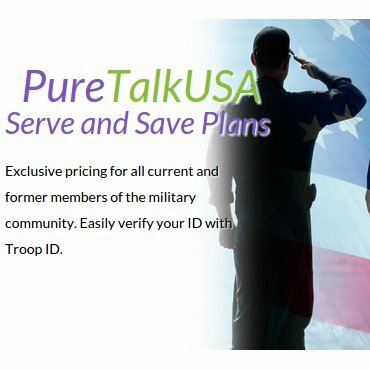 Pure Talk plans start at a much lower price point than Defense Mobile's and are a better deal for light users of data. On the other hand, Defense Mobile offers plans with up to 12 GB of data, while Pure Talk's top plan is limited to just 2 GB. Defense Mobile also donates 10% of its profits to veterans service organizations and hires only veterans for its US based customer service operations. When comparing Pure Talk and Defense Mobile pricing you need to take taxes and fees into account. There are no taxes or fees with Pure Talk. Defense Mobile adds taxes and fees that can add 30% or more to their plans monthly cost. Thanks for serving! We are going to charge you more than most others.... is this a joke? these are good prices. so what if you don't want to pay it. Wow a dollar off. Let me sign up for this garbage. I think I'll stick with Cricket Wireless. Where you get more for less. Dennis, does PureTalk allow mobile hotspot for their Unlimited Talk & Text plans? Their Terms and Conditions don't expressly say you can't, but they probably wouldn't help you get it working, either.